The Real Care baby simulators are out again this year. These babies require the attention of a real baby. This real life baby assignment began for Home Economics/Family And Consumer Sciences classes on February 13th and will end around May 1st. The baby simulators are a chance for students to get a good idea of what caring for a real baby is like. Real Care Baby requires things such as feeding, diaper changes, burping, rocking etc. The baby actually cries and makes noises like a real baby such as cooing, burping, coughing and crying. The baby’s neck is also very sensitive. Some students have mixed emotions about this baby simulator. “It’s embarrassing to take it out in public because you get dirty looks and you feel like everyone is judging you, but then again you feel like a part of you is missing when you don’t have it because you are so used to caring for it,” said Kaylen Thomas. The students must make sure the baby’s neck and head are supported at all time. If the baby is mistreated (left crying because of not being fed or changed or if the student fails to give the proper head support), points are deducted from the student’s grade. 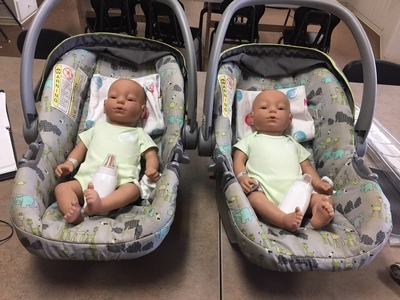 The students have the baby for three days and can choose which week or weekend they are assigned to care for the baby simulator. During this time the student is required to wear a bracelet that lets the baby know that they are there when the baby begins to cry. They get an extra arm band in case something comes up and the student has to have a baby sitter. Real Care babies came to our school around two years ago, they are assigned out to students every year. This gives students a good opportunity to experience what it’s like to be a parent of a newborn. “The reality is the impact of a baby on goals, relationships and time,” said Kim Oswalt.